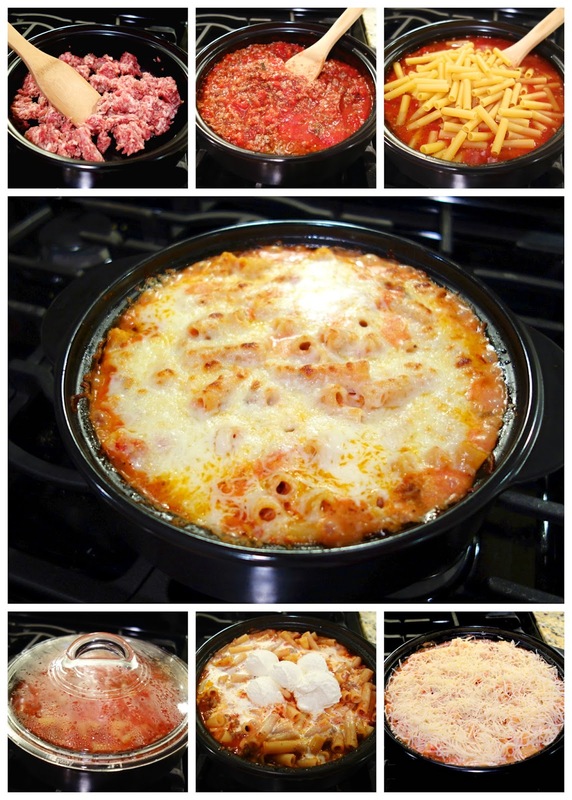 One-Pot Baked Ziti - everything cooks in the same pot, even the pasta!!! Italian sausage, onion, garlic, crushed tomatoes, water, ziti pasta, ricotta, heavy cream and mozzarella cheese - 100% from scratch pasta dish that is ready in under 30 minutes! Everyone (even the kids) LOVES this recipe!! I am so excited about this recipe. This is my new "go-to" recipe for Baked Ziti. I especially love that you don't have to boil the pasta and this is made in one pot. My favorite cooking method! This smelled AMAZING while it was cooking, and it tasted even better. Chicken Legs took one bite and said I could serve this in a restaurant. I had to agree. I actually thought it was better than any baked ziti I've had in a restaurant. It was seriously delicious! I had leftovers for lunch and it tasted just as good, if not better. The sauce is a big part of this recipe. Make sure you use a good quality can of tomatoes. I used a can of crushed San Marzano tomatoes. I highly suggest splurging on San Marzano tomatoes. I think they make a big difference. I bought the tomatoes at Earth Fare, but I've also found them at Fresh Market. I made this dish in the new Pampered Chef Rockcrok Everyday Pan. Have you heard of it yet? Well, let me tell you, it is awesome! The Rockcrok is a ceramic pan that doesn't require any seasoning. This pan is magic! The Rockcrok is heat safe up to 752 degrees. It can be used on the stove, oven, broiler, microwave and the grill. It is also freezer and dishwasher safe. Score! The most amazing thing about this pan is that you take take it straight from the refrigerator to the oven or grill and it won't shatter. Perfect for easy weeknight meals! It also keeps the food warm extra long - our pasta was still piping hot when we went back for seconds. Brown Italian sausage in 9-inch (2.5qt) oven save pan until browned. Drain fat. Add water and ziti. Bring to a boil. Reduce heat to low and cover skillet. Simmer for 15-20 minutes, until pasta is tender. i love pampered chef, havent been to a party in years tho, i think my knives are my fav thing i have! Send one over to me! Love pampered chef! I love there baking stones. I love pampered chef. One of my favorite products is their stoneware bakers. I love Pampered Chef and now I know what we're having for supper tonight. Thanks! I'm a loyal Pampered Chef fan :) I even had a PC bridal shower and it was so awesome! My favorite currently is simply the stainless steel cookware. It's taken some learning, but SS isn't as finicky as I originally thought! I love my pizza cutter - use it to cut everything....and the stoneware! Oh my gosh, I've never used Pampered Chef, but everything sounds great, would love to give it a try! I really want to try lots of there products. I have never tried the Pampered Chef product but enjoy this one. I have never used Pampered Chef but I would love to have some of the baking sheets. I've never used Pampered Chef, but have always heard great things! Your recipe sounds pretty divine, must be the cream that sends it over the top~yum! This rockacrock pot sounds amazing~I think my favorite pampered chef purchase was a baking stone, but I broke it :( Anyhoo, I always love your deliciously simple recipes! That looks cool! Love Pampered Chef. I love my stoneware...I have lots of pieces! Hmmm my favorite Pampered Chef product? I have a knife I got years ago and I use it EVERY DAY. Love it. I love all of my stoneware... Especially my covered deep dish baker! I love and use the pizza stone all the time! I use the Pampered Chef Mix N Chop tool all the time! If I don't win this pan - I think I need to buy one. I love pampered chef! This ziti looks really good! Love Pampered Chef and use one or another of their products almost daily. Would love to add this piece to the mix. This looks really yummy, and what a cool pan! My garlic press is my favorite Pampered Chef item!! Pizza stone, love it and use it always. This looks AMAZING! Love Pampered Chef products! I don't have any products but I here so many good things I need to check them out. I'm making the ziti this week love the no boil! I use my Pampered Chef batter bowl every day! I love the microwave veggie cooker. I use it to brown hamburger in the microwave in minutes with no mess! I love the chicken roaster, and so many more products! I have needed something like this for a long time! I always want to make these recipes but I don't have the appropriate pan. My Pampered Chef pizza stone is my fav! My pizza stone. I love it! That does look really good, and I love the whole one-pot aspect! I love Pampered Chef products! I love Pampered Chef. I use their cinnamon and the chop tool for browning hamburger. I also have their glass pour and measure bowls. This pan looks so nice. Thanks for offering this give away! I use the pizza stone all the time and love it! I use and enjoy my pizza stone at least once a week. I love the deep dish covered baker, but this looks even better! My favorite pampered Chef product would have to be my can opener. I love that it's so easy to use. I love Pampered Chef! I need this pot! Too many P.C. favorites to pick just one! I use the cutting boards (love the no-slide rubber edges) every day and I adore their garlic press! I really like the brownie pan. I love the deep dish covered baker! My covered deep dish baker is by far my favorite.. along with my food chopper! What ISN'T my favorite PC product??? I use my round pizza stones the most. They make the BEST cookies! I don't have any Pampered Chef products, but have looked longingly at the pizza stone and many of their utensils. This looks like an amazing dish, I would really consider replacing some of the other casserole dishes that I have with this one! Very user friendly!!! My favorite product is my wisk!!!! Can't wait to try this pan. I love all of my pampered chef stones! I use them everyday! I love my pampered chef stuff. I have spatulas that I have used for years. I would love this RockCrock!! I love everything pampered chef. My favorites and most used obviously is the pizza stone and garlic press. Have had for 16 years and still work amazing. I have a mini serving spatula that I love and use all the time. I am looking forward to making this. It looks fabulous. I actually don't own any Pampered Chef, but I'd to love to! I love the food chopper. I've had it for years and probably couldn't cook if I didn't have it. The s'mores cake in the rockcrok is so good. I love all my pampered chef. I love the PC measure & mixing bowls. I also have a large rectangular baker I love. My favorite product is the veggie peeler...I know it sounds crazy, but that thing can peel anything! Looks yummy!! I had a Pampered Chef party when I was engaged...I still use all the cool things I got and that was over 15 years ago!!! I love my mixing bowl - I use for so much - would love to try this out! My favorite Pampered Chef product is the large round stone with handles! I use my Pampered Chef baking stone a lot! This Rockcrok sounds amazing...would love to have one! Their can opener is the best, hands down. This recipe sounds amazing. Can't wait to try it. The recipe sounds great! I love Pampered Chef products! What a great pot. Looks like you could use it for so many things. I use my 8 cup Pampered Chef measuring cup almost daily...Love it! I ♥ Pampered Chef ~ I adore my baking stone and mini spatula!! I hope I win! I love pampered chef! I love Pampered Chef - I have several of the stone baking dishes. Hosting a party in November just to get this for 60% off. I have SO many pampered chef favorites! My most beloved are my mix and chop and my 12" non-stick pan with the lid....and the ice cream scoop.....and the tongs. I could go on forever! 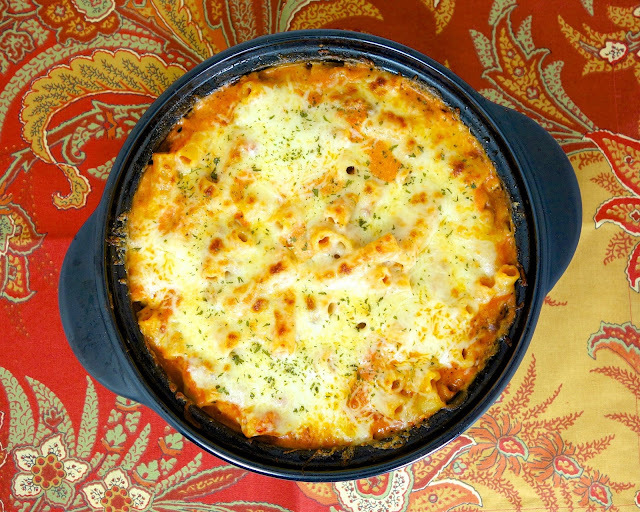 I am a huge Pampered Chef fan but had not heard of this magic pot:) I had baked ziti last night and we love it! Have a blessed day and I hope I win! I love all of my Pampered Chef products! I use my mix n chop several times a week along with the 8 cup measuring cup/bowl. Fave product has to be the smooth edge can opener.....which I ordered the day DH cut his hand on a can opened with a traditional opener and had to get three stitches!!!! My Pampered Chef baking stone, I have had for years. No pampered chef products yet, but I would love one! I love pampered chef. I've had their garlic press for years! It's been awhile since I've purchased from Pampered Chef--there used to be home parties all the time - - not so much any more. I have some wonderful items and this would be a welcome addition. Thank you. I don't own any Pampered Chef products and I honestly have no idea why! Always hear wonderful things! I've been wanting a pan that can go from stovetop to oven to brown cheese up - ya know - to make it even yummier. Love one pot dishes so much - total lifesaver on busy nights! I love my pampered chef Kitchen timer and my clear, stackable measuring cups, both the liquid and the dry. I also love my cutting boards and my utensil turnabout. I haven't been to a pampered chef party for a long time. I have a small micro cooker that I use quite often. This pot looks amazing! I have a pamaperd chef baking stone and some microwave pots that I used daily, I'd love to add this to my collection! That looks delicious! And, gotta love that one pot cooking!! Sounds delicious - I love your one pot meals! I also love Pampered Chef's pizza stone and garlic press! This pan sounds wonderful. Would love to win! Oh yummy, cheesy deliciousness. I love ziti. From Pampered Chef I love the Brownie Pan. This pot sounds awesome! I don't have many PC products (they are expensive), but I love the ones I do own. I love Pampered Chef baking stones and also wooden spoons. Truthfully it's been years that I've been to a Pampered Chef party. Went to zillions years ago and loved their products. They are the reason I became interested in cooking . I love their large measuring bowls. Ues them almost everyday. This sounds amazing! I love my PC covered roaster. Oh, I LOVE Pampered Chef products and hope I can win one of these!! I LOVE my baking stone & apple slicer too!! I love all of my Pampered Chef spatulas. My Pizza Stone! I've had it for 10+ years and it just gets better with every use. Love Pampered Chef products!!! Haven't been to a party in years. My favorites are the baking stone & veggie chopper. I just got a flyer in the mail yesterday for the Pampered Chef Rockcrok Everyday Pan! I was wondering how good it was! Guess I got my answer! Love all of their Stoneware! I adore Pampered Chef! My favorite item has got to be their cookware. LOVE it! My favorite pampered chef products are my can opener and mini offset spatula. Amazing, is this the pan they have in this series? I really would love to have it!!! Please pick me. Like many above, my favorites are my stones! I too have one that is 20 years old - I can't believe it's been used that long! Use them several times a week. I would love to have this cookware for use. I love all of the pampered chef products, but my favorite right now is probably my large mixing bowl with a lid. I use it all the time for so many different things! I have so many awesome Pampered Chef items that its hard to choose just one but the one I use EVERY DAY would be their kitchen shears!! LOVE THEM! I just simply can not name my favorite product. I absolutely love them all!! Please pick me!!! I love the pampered chef dill mix. So good, especially on buffalo wings!! I love the Mix and Chop!! Love all the Pampered Chef Products. My favorite is so hard to decided probably large mixing bowl for it diversity! I have a lot of Pampered Chef favorites. Probably the stones and spatulas are my favorite. My favorite Pampered Chef products are the Classic Batter Bowl and Can Opener. I both of these several times during the week. I love my pampered chef veggie peeler! I love the measure all cup for measuring peanut butter and shortening! yum! And Pampered Chef is amazing!!! Love it. I adore one pot meals! And Pampered Chef. Love Pampered Chef products! Can't wait to try this recipe out. I love Pampered Chef pans! I would love this Rockcrok! I love the items I already have from Pampered Chef! I would have to say it is a tie between my stone rectangle baker and the food chopper! Both equally life changing in my kitchen! this looks AWESOME! I will use my dutch oven until I win this Rockcrok. Love Pampered Chef! 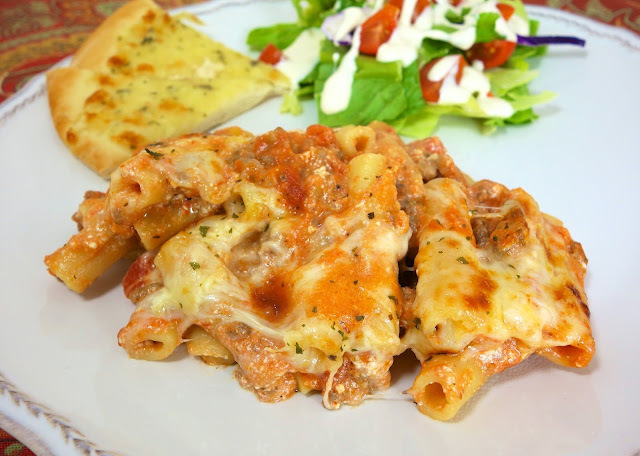 And this baked ziti looks like a perfect winter night meal. Love one-pot meals, and I sort of NEED one of those Rockcroks! I love all the products I have, but I use the pizza stone the most. Recipe looks great! My favorite Pampered Chef items are the batter bowls (with handles & lids). I use them all the time to mix and store. Can't wait to make this. My fav Pampered Chef product is simple, mix and scraper. Works great for so many things! I love Pampered Chef! Haven't bought any recently, but have many many of their products...use their Garlic Press quite often (love it). I have the Pampered Chef Mandolin, which used to scare me...was always cutting myself, so put it away. I rediscovered it recently, and now use it like a pro=) You can't beat it for those uniform slices! I'd love to win this beautiful Rockcrok...first thing I'd make would be your Baked Ziti; sounds and looks delicious! Thank you! I love their bamboo spoons. My daughter calls them Kool Aid spoons because we use the long one every time we make Kool Aid. Two of my favorite things! Pampered Chef and Plain Chicken!! Keep these awesome recipes coming! I never cook without using some kind of pampered chef product! I love the stones! I'm hosting a PC party in two weeks. I'd love to win this! What a fantastic opportunity! I would love to own this pan. I love my spoonula and my pizza cutter.. I use something PC nearly every day! I enjoy using the scoops for making cookies.. love all the sizes. Love the looks of both the pan and the contents, gotta try them. I am in need of a pan that I can use from stove to oven.... this looks like the perfect one! Can't wait to try this recipe! I love the Pampered Chef pizza stone! I love all things pampered chef! I was so excited about the new RockCrok when I saw it! My favorite product would have to be my deep dish baker. I just love that thing! I love my Mom and my Aunt's pampered chef's products but I don't have any of my own. Would this be a recipe that would freeze well? And if so, how do you recommend freezing it? Thanks! I love Pampered Chef products! There are so many of them I use regularly: egg slicer, cheese grater, pizza stone, cheese knife, mini spatulas, etc. etc. I could go on and on lol! I love Pampered Chef, too!! Just went to a party last month! It would be awesome to win this!! I have never used Pampered Chef products before, but would love for all of that to change if I win this awesome piece of cookware! Awesome giveaway! Have tons of Pampered Chef items, but my green knife set is probably my favorite! I have several favs: my cookie scoop, corn cob cutter, sandwich press and giant pizza cutter! I like that tool that breaks apart ground meat. I have no idea what it's actually called, but it's great. Thanks for the giveaway! Am I the only one not able to find the Rafflecopter Widget for the giveaway?? Looks great! It would be my first PC product to try. Thanks for the chance! Oh, I would love to try Pampered Chef!!! I have some of their stone bakeware and I love it. It has lasted forever and works great! I love their measuring cups and spoons! I love the silicone spatulas; I never can seem to have enough of them! I love the microwave steamer. So convenient for making fresh veggies after work. I love the batter bowl! My favorite is the Rotary Grater...it got my husband to stop harassing the Olive Garden wait staff...so that's a bonus too!